Two years ago, when the New York Times instituted their paywall, I wrote about several ways to get around paywalls. I know it sounds a bit unscrupulous, but if you aren’t a devoted reader of any one website you probably don’t want to pay for a subscription. 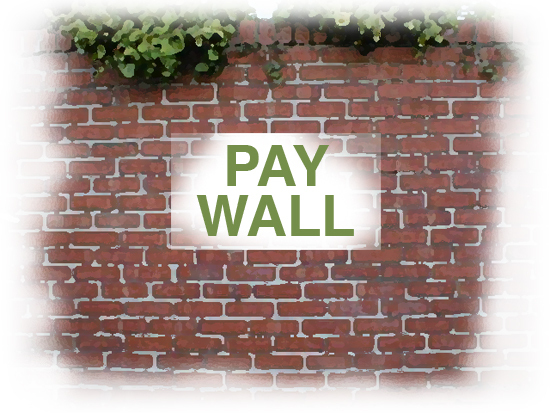 Even if you browse a lot of different sources, you’re likely to encounter a paywall at some point. 1. Go into your browser’s cookies and delete all the cookies for that website; also clear your browser’s cache. 2. Copy the article’s title and do a search for it on Google. Click on the Google link back to the story. 3. Switch to a different browser where you haven’t yet hit your monthly limit for that website. Copy the article’s URL and paste it into the box at Readability.com. * Click “Shorten & Read” and then, below it, “Read Now.” You’ll see the full story, imported in a handsome, highly readable format, free of all the surrounding content (including comments, unfortunately). If you want to read the story on its original site, there’s a link (“original”) at the top of the story. If all else fails, try browsing in incognito mode. Note — Nov. 27, 2016: The Readability.com service shut down several months ago. Thought I’d pass along the information, just in case. Don’t know how Readability escaped my notice until now. I feel the same way. A single story, once in a while, is not worth paying for. Pretty much mirror Karen’s response on this one although if it is an article regarding national interest I can usually chase it down in some other newspaper similar to what you suggested in #2 on your post. In most of my cases I am just trying to secure a ‘link’ for reference but I want to know that I can go back to it at a later date and/or share it and that it will still connect to my subject matter! Paywalls don’t apply to incoming links. That’s why the Google thing usually works. If you include a link in one of your posts, readers who use that link to get to the story will not face a paywall. Dang girl, you are full of handy dandy little tips. I had no idea you could do something like this.Thanks.